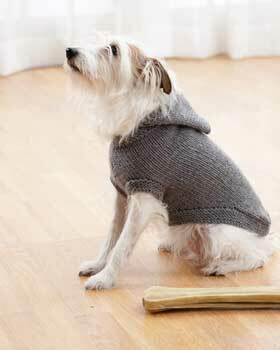 Keep your dog warm this winter by knitting him a cute little hooded dog coat from Bernat Yarns. Using Bernat Super Value you can make this with a free knitting pattern. 1 (1-1-2) ball(s) of #53044 (True Grey). Size 5 mm (U.S. 8) knitting needles. Size 4 mm (U.S. 6) circular knitting needle 36 ins [90 cm] long or size needed to obtain gauge. Set of four size 4 mm (U.S. 6) doublepointed knitting needles. 18 sts and 24 rows = 4 ins [10 cm] in stocking st with larger needles. The instructions are written for smallest size. Larger sizes follow in ( ). With larger needles, cast on 40 (46-58-82) sts. Knit 5 rows, inc 4 sts evenly across last row. 44 (50-62-86) sts. Proceed in stocking st, inc 1 st at each end of needle on 3rd and every row to 50 (60-72-104) sts, then on following alt rows to 54 (68- 82-122) sts. Purl 1 row. Leg Openings: Next row: (RS). K5 (5-7-11). Cast off 4 (6- 6-10) sts. K36 (46-56-80) (including st on needle after cast off). Cast off 4 (6-6-10) sts. Knit to end of row. Note: All Leg sections are worked at the same time using separate balls of yarn for each section. Beg with a purl row, work 1 (1½-1½-2½) ins [2.5 (4-4-6) cm] in stocking st, ending with purl row. Joining row: K5 (5-7-11). Cast on 4 (6-6-10) sts. K36 (46- 56-80). Cast on 4 (6-6-10) sts. Knit to end of row. 54 (68- 82-122) sts. Cont even until work after neckband measures 5 (6½-8-11) ins [12.5 (16.5-20.5-28) cm], ending with purl row. Place marker at each end of last row. Back shaping: Cast off 6 (7-9-13) sts beg next 2 rows. 42 (54-64-96) sts. Next row: (RS). Sl1. K1. psso. Knit to last 2 sts. K2tog. Next row: Purl. Rep last 2 rows to 26 (36- 42-66) sts. Cont even until work after neckband measures 10 (12½-15½- 21) ins [25.5 (32-39.5-53.5) cm], ending with purl row. Leave sts on a spare needle. Hood: Place markers along cast on edge on 6th (7th-9th- 10th) st from each edge. (RS). Pick up and knit 29 (33-41-63) sts between markers along cast on edge. Purl 1 row. Next row: (RS). K14 (16-20-31). M1. K1 (place marker on center st). M1. Knit to end of row. Next row: K3. Purl to last 3 sts. K3. Next row: Knit to center marked st. M1. Knit marked st. M1. Knit to end of row. Rep last 2 rows 4 (5-7-9) times more. 39 (45-57-83) sts. Cont even until hood measures 5 (5½-6½- 7½) ins [12.5 (14-16.5-19) cm], ending with a purl row. Cast off. Fold cast off edge in half and sew hood seam. Back Ribbing: (RS). With circular needle pick up and knit 33 (37-51-67) sts along body from marker to back. K26 (36- 42-66) from spare needle, dec 1 st at center. Pick up and knit 33 (37-51-67) sts along opposite side of body to marker. 91 (109-141-197) sts. Do not join in rnd. Knit 8 rows. Cast off. Sew neck and belly seam. Leg Edging: (RS). With double-pointed needles, pick up and knit 23 (29-32-38) sts around leg opening. Divide sts evenly on 3 needles. Join in rnd, placing a marker on first st. Work 8 rnds in garter st. Cast off. my cats got into a fight with some stray dogs and got hurt pretty bad but they survived. It took a while for the scars to heal I I had to make them a coat to prevent them from licking their ointment. It kept slipping off and I never thought of knitting or crotcheting this. Thank you so much. This would be perfect for my little guy in the cold weather. I attempted to make this adorable coat, but when I reached the leg openings, it got confusing and the distance between the front and back paws is certainly not enough - one to two and a half inches? The leg openings are not big enough either. And where do I add another ball of yarn? Is the back knitted separately? Thank you for your help. Is the initial cast on row (Larger needles, 40 rows) considered the neckband? I'm jsut past the joining row and want to make sure I'm measuring from the right point. Do I measure from the joining row or from the start of the pattern? I made this for a friends fur baby and put sleeves on it for his front legs to help with his arthritis. As I have no clue how to design garments, for people much less fur babies, if anyone out there has a design on how to add sleeves for the hind legs I would sure like to know how. Thank you.